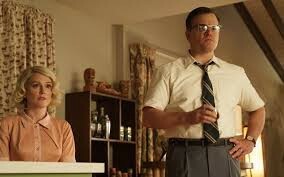 Welcome to suburbicon! It’s a gee-whiz community where nice people — nice white people, that is! — reside on manicured lawns and raise their wholesome families. Everybody is super-friendly and always say hello to each other at the grocery store. Then one day, a black family moves into town. The aghast postman can barely even deliver the mail! The businessman neighbor loses control over the car! How dare these people have the gall to move in. An angry mob will throws bricks at their house and place a confederate flag in their window in protest. All the while, nobody realizes it’s the Wonder Bread family living next door that really deserve to be vilified. George Clooney’s black-comedy satire is set in the 1950s, years before Martin Luther King declared that he had a dream. That’s not a coincidence. Clooney is obviously making some sort of statement about the modern-day parallels and the dangers of putting up walls (or, in this case, picket white fences) in hopes of making America great again. But just because a movie is socially relevant doesn’t make it a riveting, poignant must-see. I suspect it will come and go after its October release with barely more than a shoulder shrug. After all, original ideas — as well as characters worth caring even one iota about — mean something in any day and age. 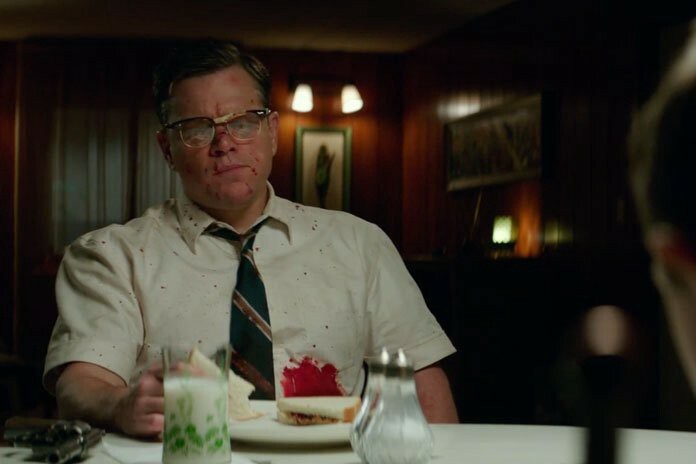 Matt Damon (and regular Clooney co-star) once again plays the supposed Every Man — here, he’s Gardner Lodge, husband of a disabled woman and dad to a prepubescent son, Nicky (Noah Jupe). His sister-in-law resides in the house as well. (Julianne Moore plays both roles in a rather effective gimmick.) He seems decent and caring. The Lodges are all victims of a seemingly random home invasion that results in the death of Lodge’s wife. What a tragedy. What a tantalizing wind-up. Wait. Why doesn’t Lodge correctly IDs the criminals? Why is an insurance adjustor (Oscar Isaac, dandy), a “professional skeptic,” knocking up at the door? We can’t really call this a mystery when the pieces click together so easily (and lazily). Poor Nicky figures out the sinister plot as well, wary of the close relationship between his father and aunt. He’s just a kid, though. And father knows best. If only his neighbors in Suburbicon would take in interest in what’s going on with the Lodges — but no, they’re too busy targeting the outsiders of a different skin color. The racial violence spirals out of control, with zero repercussions. Brothers Joel Coen and Ethan Coen, who have crafted classics such as Fargo and No Country For Old Men, originally wrote this script back in the late 1980s. Clooney has said he revived it and folded it into a project he was developing about the real-life first minority family that movie into picture-perfect Levittown, Pennsylvania. This mash-up would explain why the film is a clumsy mix of macabre, off-kilter humor and heavy-handed moralizing. Notice the dim-witted man in over his head plotting a crime (Coen!) and the exposure of socio-political issues (Clooney!). The problem is that nothing resonates or feels special. Even the targeted family have little to say above a frustrated, exasperated expression. Clooney, who’s had a hot and cold record as a director (Good Night and Good Luck, The Ides of March, Leatherheads, Monuments Men), missed an opportunity here to helm a movie oozing with true subversive bite. Because this is essentially a Coen brothers production, don’t expect a tidy ending. That’s for the best: Nobody here is worthy of redemption anyway, except for the color-blinded kids. Lodge’s scheme is exposed. It collapses in possible every way. Next time, Clooney should take on a project that truly breaks ground.